Cacao is the origin of all things chocolate. If you love hot cocoa, chocolate bars, chocolate milk, and chocolate chip cookies, you can thank the cacao bean from the cacao tree. The tree is an evergreen that is native to the tropics of South and Central America. The tree produces a pod, or fruit, each of which contains between 20 and 60 seeds. These seeds are the cacao beans and are the part of the plant that is the main ingredient in chocolate. To make chocolate from cacao beans, the beans and pulp are removed from the pods and left out to dry. The pulp ultimately liquefies and drips away, leaving just the dried beans. The process of drying is important to developing the flavor of the beans. If done incorrectly, or interrupted, the beans will not taste right. After the drying process, the beans must be treated further in a process called fermentation, after which they are dried again. At this point, the beans are ready to be turned into various chocolate products. To do this, the beans are roasted, the shells are removed, and the inner bean is broken into pieces, called nibs. These can then be ground up and other ingredients added to make cocoa powder, chocolate, and other products. Cacao trees and the cacao beans they produce have a long history in the Americas. They have been cultivated and used for thousands of years by native people. Archaeologists have found cacao residues in vessels dating back nearly 4,000 years. Natives to tropical regions used the beans for culinary, medicinal, and economic purposes. They served as currency during the Aztec empire and a beverage made from cacao was important in religious rituals. There is also evidence that the indigenous people used cacao to treat snakebites, to get strength and energy, and to relieve breathing problems. As is often the case, the native people of Central and South America understood many of the benefits of this food long before modern medicine could catch up. The high level of flavonoids, or antioxidants, in cacao is one of the main reasons that this food is so nutritious. Cacao beans contain more antioxidants than blueberries, acai berries, or red wine. When you pick some up at the store to add to your smoothies, just be sure you are getting raw cacao to reap all the benefits. Cholesterol: Your cholesterol levels can be improved by consuming cacao. In studies, it decreased the amount of bad, or LDL cholesterol in participants while also increasing levels of HDL, the good cholesterol. Improved Blood Flow: The flavonoids in cacao have been shown to improve the functioning of blood vessels throughout the body, allowing blood to flow more freely. The consequences of improved vascular function are very important and include a reduced risk of both heart attack and stroke. Furthermore, those who survive heart attacks are at a reduced risk of dying if they consume dark chocolate two or more times each week. Diabetes and Insulin: Cacao has been linked to reducing risk factors for diabetes, such as obesity. It also decreases resistance to insulin, which is what happens in people with type-2 diabetes. Insulin regulates blood sugar and those who develop a resistance to it end up with diabetes. Resistance can be lowered by consuming cacao, resulting in better blood sugar levels. Obesity: In the same study that found that cacao consumption could regulate blood sugar levels, the researchers found that eating cacao did not increase blood fat levels. This means that cacao will not lead to weight gain or obesity. Of course, this does not include chocolate products loaded with sugar and milk fats. Blood pressure: Cacao has been seen in studies to reduce blood pressure in participants. Patients that were obese and those at a healthy weight saw the same effect of lowered blood pressure when given doses of dark chocolate. Cancer Prevention: According to a report in the European Journal of Cancer Prevention, rats that were induced to grow prostate tumors by consuming a carcinogenic chemical and simultaneously given a cacao extract had fewer tumors and lived longer than those who were not given the extract. A moderate dose proved to be more effective than an excessive amount of the cacao extract. While a study on rats is not conclusive for effects on humans, the results are promising. Brain Function: Thanks to the high levels of antioxidants in cacao, eating chocolate can help you maintain healthy brain function. Cacao helps to improve the functioning of blood vessels, which means more blood gets to the brain. This leads directly to better brain functioning, particularly in those with damaged blood vessels. Improved Vision: Research out of the United Kingdom has shown that the antioxidants in cacao can improve your vision. Participants in the study ate dark chocolate and then had their vision tested in several different ways. Compared to a control group, those who ate the chocolate had better sensitivity to contrast and shorter reaction times when responding to motion. 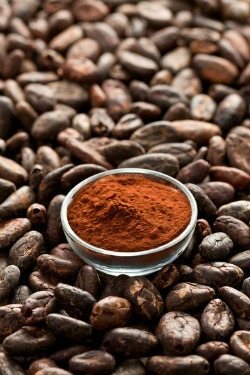 Magnesium: Cacao has more of the essential mineral magnesium than nearly any other food. It is essential to many processes that go on in the body, but is particularly important for bone health. Most Americans are deficient in Magnesium. Mood Booster: As all chocolate lovers know, cacao makes you feel better. There is a chemical reason for this. Cacao is high in the amino acid tryptophan, which your body uses to make serotonin. Serotonin is a neurotransmitter in the brain that is connected to sleep, appetite, and mood. People with anxiety and depression disorders have low levels of serotonin. What is raw cacao? Raw cacao is cacao that has been minimally processed. When it is processed too much, especially when heated to a high temperature during the roasting, cacao loses many of its valuable health properties. Raw cacao may have been heated, but not enough to destroy its healthful benefits. What are flavonoids? A flavonoid is a type of antioxidant that is found in plants, specifically in most fruits and vegetables as well as cacao, coffee, tea, and wine. Flavonoids are responsible for the color in flowers, among other things. When consumed by humans, flavonoids act like antioxidants in the body. This means that they repair damage and may contribute to the prevention of cancer, infections, inflammation, and allergies. What is the difference between dark and milk chocolate? Dark chocolate contains a higher percentage of cacao than milk chocolate which contains sugar and dairy products to give it a sweeter, and less bitter taste. Dark chocolate contains no milk, but some sugar. Neither one, however, counts as raw cacao. Your best bet for buying the most nutritious product is to find raw cacao powder or cacao nibs. Cacao powder or nibs go well in any sweet smoothie that you feel would be complemented by a chocolaty flavor. Just remember that raw cacao does not taste like a chocolate bar. When using raw cacao, you need a natural sweetener, like stevia, honey, or fruit, to bring out the rich chocolate taste. Experiment with flavors and combination to find recipes that suit you, but in general about one tablespoon of powder or nibs makes a good addition to a large smoothie. Here are some popular combinations for you to try right now. Cherry, almond, and chocolate. Use a little almond milk, some fresh or frozen pitted cherries along with cacao, and your basic smoothie ingredients to make a fortifying drink that tastes like a dessert. Chocolate, banana, and strawberry. With these three ingredients, plus a little honey or stevia and some water or almond milk, you will have a smoothie that tastes like a banana split. Chocolate chocolate. Why not savor the flavor of pure cacao on its own? Use two tablespoons of cacao powder for a large smoothie, use a banana to make it creamy, and add almond, coconut, hemp, or raw milk and honey for a deliciously, pure chocolate smoothie. Chocolate and cayenne. If you are feeling adventurous try this unorthodox combination. Make a simple chocolate smoothie with cacao and add a dash of spicy cayenne pepper. For all of my smoothies featuring this wonderful superfood – cacao smoothie recipes. Do you use cacao in your smoothies? What are your favorite recipes? Please tell in the comments below. Your local health food store will most likely carry the various cacao products. If you want to purchase cacao online, I recommend Mountain Rose Herbs or Live Superfoods. 29 Responses to What is Cacao and why is it perfect for Smoothies? However delicious raw cacao is, treat it with caution if you are sensitive to stimulants. I experienced major heart palpitations as if I had lots of caffeine. There is a chemical in it called theobromine which has a similar effect as caffeine but works on the respiratory/cardiac system. Try small amount before piling in and having 2 tablespoons in your smoothie! Thanks for mentioning this. Not everyone does well on cacao, and with every new food or supplement you try, it’s important to start small and work your way up. Please help I am trying to lose weight and I have tried many smoothie recipes I found online. I am not losing any weight with the green smoothie recipes I have found. Any help would mean a lot to me. Please! Fat and unhappy in Arkansas. Have you read my article on losing weight with smoothies? Please check that out and read through the comments. If you have specific questions after that feel free to leave a comment or email me and I’ll be glad to help. I want a slim and happy Sherri in Arkansas. Must you just buy the cacao powder? If you live in the right climate you could grow our own cacao trees, otherwise, yes you must but it. The research becomes more overwhelming every year that cacao should be avoided. The downside to it is way worse than the upside. And all of its beneficial properties can be found in other foods at higher doses that are way more healthy. More experts every year remove cacao from their ‘superfood’ list. Could you please share some of the research that cacao should be avoided? I’m always open to new information and changing my stance and opinion. Some people don’t do well on cacao (can be said of any food), but many, like myself, reap the benefits. I have started to read your articles and very interested. I have read some where that mixing of cacao with maca with cocunt water gives great sense of romance and increase the libido for men. Is advisiable to do that. will there be any side effects on this combination. Cacao, maca, and coconut water mix quite well, without any side effects. Maca is known to increase libido. Can I buy your products direct online and will it be shipped to India, or else from which online merchant can I buy your products. yoghurt or non fat milk add ice cubes and stir. A bit shocked to know cocoa and cacao are not the same. I bought some cocoa, unsweetened, only ingredient is natural cocoa powder Non-Gmo. I assumed it meant raw cocoa. Does that mean it does not have the same nutritional benefits as cacao? Also pronounced differently. Is some cases cocoa and cacao are the same. Depends on the brand. Some label raw cacao as cocoa because cacao can cause confusion. Sounds like what you purchased is legit. can i add vanilla or chocolate ice cream + milk + cacao would that make like a chocolate milk shake? should i add a banana? That would make a chocolate milk shake, Blair. However, ice cream isn’t that healthy (unless homemade); so I’d suggest using a frozen banana instead, with milk and cacao. ryan, where can I buy the chia gel or rice protein powder. please let me know. I recently started using unsweetened cocoa powder daily. I am very happy that I did. For the first time in years I escaped allergy season, and I believe the unsweetened cocoa is the main reason. My favorite recipe is with oats soaked over night, one or two very ripe bananas, (one teaspoon/tablespoon of each) flaxseed, sesame seeds, cinnamon and sometimes a small amount of almond milk. And finally I started adding my cocoa powder. It turned out to be a great addition. Interesting, never heard of cacao as an anti-allergen. Your recipe looks delicious and nutritious, CarlottaAnn. How often or how much cacao should you consume in a week to get the most benefits? For most people about one tablespoon a day. However, everyone is different so I would pay attention to how you feel on more or less cacao. Can you mix it with protein powders, like if I wanted to add it to my protein shake? Absolutely, Mon. Some protein powders come with cacao in them. I walkthrough the above discussed stuff on cacao , quit impressed, as i am from india i would like to know whether that cacao will be available in india in same name or different ? How to go about to get cacao being in india. That’s a great question, Saravanan. I suspect cacao would have the same name in India. I would ask around at local health food stores as someone there should be able to help you obtain it. I haven’t found a Hot Chocolate recipe with great flavor, few ingredients, raw cacao. I would appreciate a suggestion. thank you.